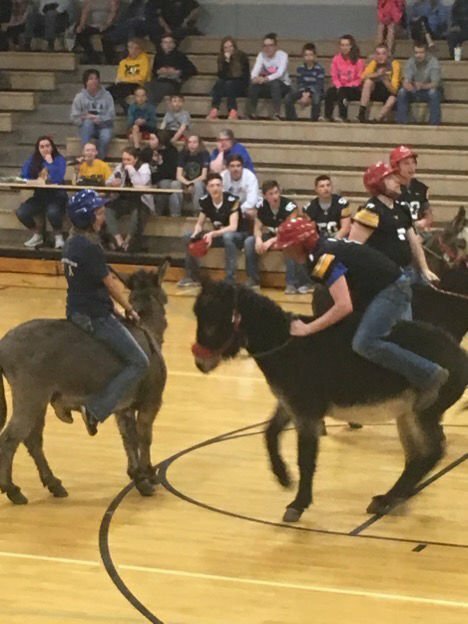 Left: W-SR FFA member Julia Bowman rides her donkey and a football player tries to stay on his during the donkey basketball game in the Bock Gym. Above: Waverly-Shell Rock FFA member Tyler Heine pulling his donkey to get the ball during the donkey basketball game on Sunday, March 31, 2019, in the Bock Gym. W-SR FFA member Julia Bowman rides her donkey and a football player tries to stay on his during the donkey basketball game in the Bock Gym. 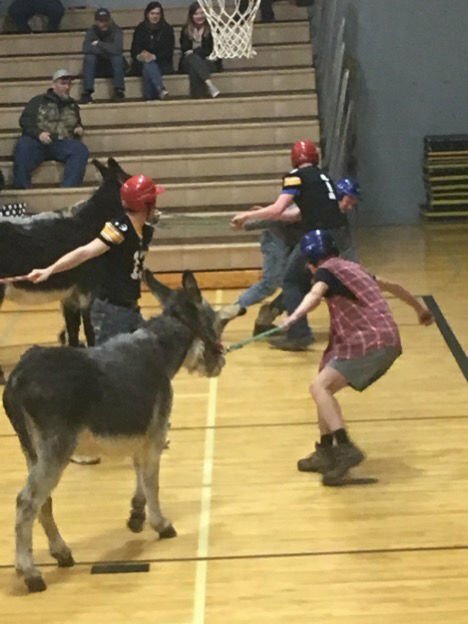 On March 31, donkey basketball was held at the Waverly-Shell Rock High School and was a big success. The Waverly-Shell Rock FFA chapter would like to send out a huge thank you to all of the sponsors and participants. The teams were made up of Waverly-Shell Rock FFA members vs. high school staff and then Waverly-Shell Rock FFA Parents/Alumni vs. W-SR football players. This year’s winning team was the W-SR football players. Without them there wouldn’t have been any success at all, and we wouldn’t have been able to have such a fun time. We would also like to thank everyone who came and supported the chapter, and we hope everyone enjoyed their time like we did. For more details of different FFA activities please contact Waverly-Shell Rock FFA Advisor Amy Mitchell at amy.mitchell@wsr.k12.ia.us.